Tiger Muay Thai & MMA proudly presents NeverTap IV, our annual No-Gi grappling tournament, held on our beautiful Phuket campus. Past events have featured grapplers from nearly every corner of the world, and student ranks spanning from white belt to black. 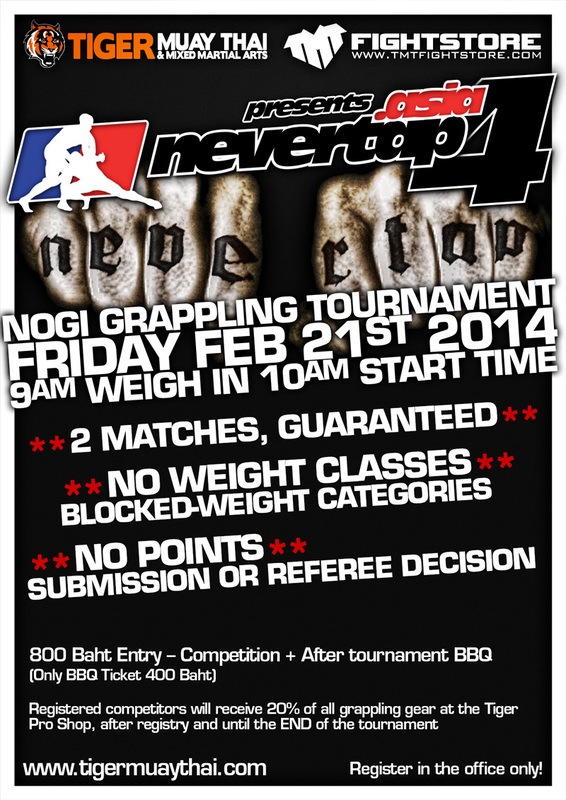 This year’s instalment will be held on February 21st, with 9am weigh-ins and a 10am start time. Blocked weight classes will ensure nobody needs to “cut weight”, as brackets will be formed based on the clustering of athletes by weight. There will not be a 10kg weight difference! Each competitor will be guaranteed two matches on the day, and included in the 800 Baht entry fee — a humble BBQ will be had, in order to feed everyone after their strenuous efforts! 5-minute matches of continuous action, decided by submission or referee’s decision (our very own BTT Black Belt, Fernando Maccachero will head the officiating crew). Medals will be given to the top three placers in each division. And we will hold an absolute division (open weight, open entry), starting immediately after the weight-group finals… And as a bonus, all registered competitors are granted a 20% discount at the Tiger Gear Shop, applicable toward any/all grappling equipment (tee shirts, rash guards, shorts, etc.). We look forward to a fantastic day on the mats, and at the Grille. Sign-up in the office only. See you there!